Presenting Sherlock Holmes: The Seven-Per-Cent Solution by David Tipton, Scott Tipton, Ron Joseph. 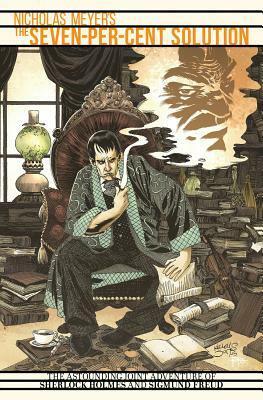 The best-selling Sherlock Holmes novel by writer/director Nicholas Meyer comes to comics! The real story behind Sherlock Holmes final confrontation with Professor Moriarty is at long last revealed! Who is the real Moriarty? Why did Holmes disappear for so long? The game is afoot!" Sherlock Holmes: The Seven-Per-Cent Solution calls into question two of Holmes & Watson's last adventures together and says that 'what if' they were faked. What if they were fabricated by Watson to hide what really happened. We all know the great sleuth used cocaine for recreational purposes but what if, the addiction finally got to him. What if Moriarity was not the mastermind criminal of the conventional order but a personal demon of the past. Doesn't really paint a pretty picture does it. The story is dark enough to warrant intrigue as Holmes spirals down into the throws of addiction and concerned Dr. Watson and older brother Mycroft with the help of Dr. Sigmund Freud devise the best way to cure him. All the while Holmes stumbles upon a case of international importance and the motley crew races to avert a world war abeit shortly. "A dark and exciting take on Sherlock Holmes"